There are many arguments about what punk rock is "supposed" to be. Angry? Political? Violent? Silly? What often gets lost in these arguments is that at it's heart, punk rock is supposed to be fun. Saturday night at the Knitting Factory was probably the most fun you can have with your clothes on. 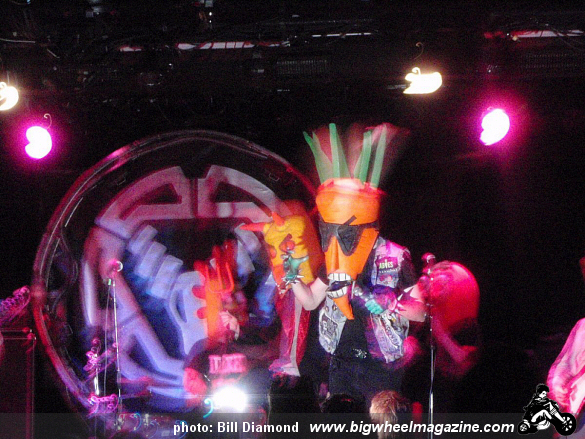 Opening the show were Los Angeles' very own The Radioactive Chicken Heads. The Radioactive Chicken Heads are a group of mutated chickens, fronted by a mutant carrot, and supported by a tomato on guitar. You know, like any other band. The Radioactive Chicken Heads avoid the common pitfall of so many gimmicky bands, though. They've got good songs. No, scratch that, they've got great songs. 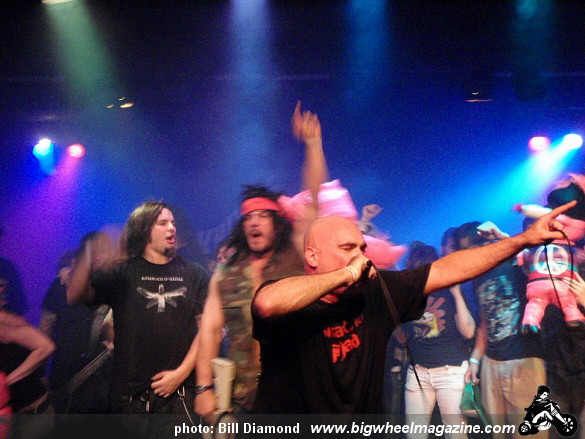 With sort of a metal-ish Punk rock sound, they were definitely right at home sharing a bill with Green Jelly. The crowd responded well to the music, and even better to the lithely attractive "Wikkan Chicken" who came off stage to dance with audience members. If you're not comfortable being freaked by a mutant chicken in a witch hat, you might want to stay home. The band isn't all shock value though, they managed to squeeze in some public service announcements about the dangers of liquid fat, and the benefits of eating kids, as well as an excellent cover of The Who's "Boris the Spider" (complete with dancing... er... cockroach. Just go with it.) before their set was cut short. If you're looking for something brilliant, funny, and addictively catchy, head over to http://radioactivechickenheads.com to check out the tour schedule, or their mp3 page. Next up was psychobilly outfit Frankenstein. No costumes on these boys, but tight musical chops, they kept the energy high, and were rewarded with the night's first circle pit. Those of you in the UK might find this band reminiscent of The Hangmen, but Frankenstein has been part of the LA scene since 1989. Their lineup reads like a super group from hell, and they had no problems keeping the crowd moving. Check out http://www.frankensteintheband.com for more on these guys. Veterans of the LA underground scene already know and love Rosemary's Billygoat, the third band of the night. 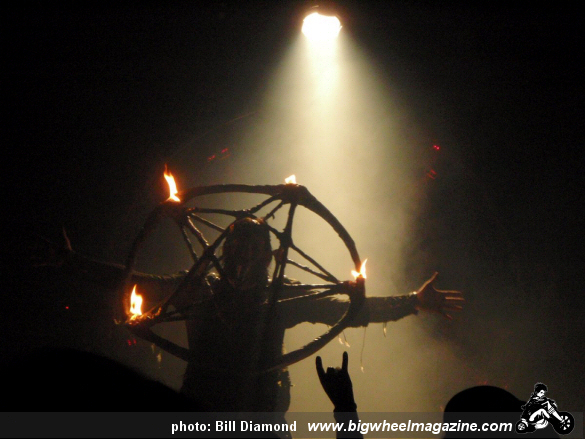 Equally at home at performance art galleries and more traditional venues, Rosemary's Billygoat combine heavy metal riffs with frenetic energy, fire breathing, and delicious satanic pizza, storming the stage and showing the crowd no mercy. The audience Saturday night ate up the demented stage show, dancing, and at one point crowd surfing the giant plush cross singer Mike Odd had been crucified on. The band covered songs from both Haunted Garage, and Pat Benetar, and if that sounds like a contradiction, somehow in their hands, it wasn't. Head over to http://www.rosemarysbillygoat.com to see a little slice of the madness for yourself. Given no chance to rest, co-headliner 45 Grave came up next. I shouldn't need to tell you who 45 Grave is. Fronted by the queen of death rock Dinah Cancer, 45 Grave re-formed with a new line up in 2004 marking the band's 25th anniversary, and they've lost none of the raw power and aggression that's made them so popular. The band played many old favorites including "Fucked by the Devil", "Black Cross", "Evil", and the ever popular "Party Time". The crowd was also treated to a new song, due out later this year. Old and new material both went over well and the room stayed dancing through the whole set. Finally Green Jelly (still pronounced "Jello" I just can't make umlauts on my American keyboard), "the worst band on earth", came up to finish out the night. If you've never preformed a set with no pants on, crowd surfed on your own stage, or had to push cookie monster out of the way to finish a song, you're clearly not the singer for seminal Punk rock clowns Green Jelly. If you've never cheered for Toucan Son of Sam, participated in a puppet mosh pit, or sang along with a punked out Fred Flintstone to "Anarchy in Bedrock*", you're probably not a fan. And more's the pity for you. The set started with the appearance of the Cowgod, and included the aforementioned "Anarchy in Bedrock" and "The Bear Song" among others. 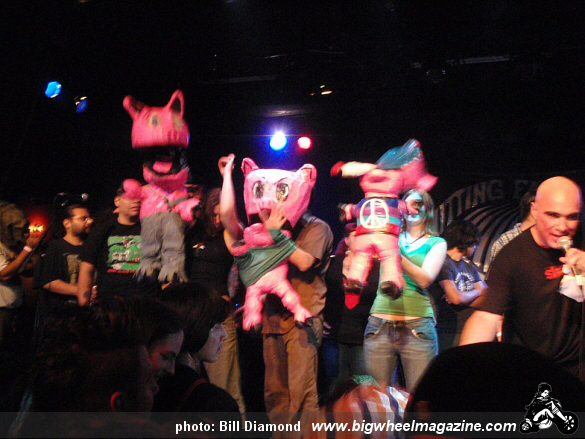 Audience members spent more time on stage with the band than on the floor, donning puppet heads for the puppet mosh pit, and working the three little pigs for the closing number, and Green Jelly's major hit aptly named "Three Little Pigs". The only downside to the entire show was Green Jelly's refusal to do an encore, leaving the audience in high spirits and craving more. But hey, that's the first rule of show business, right?